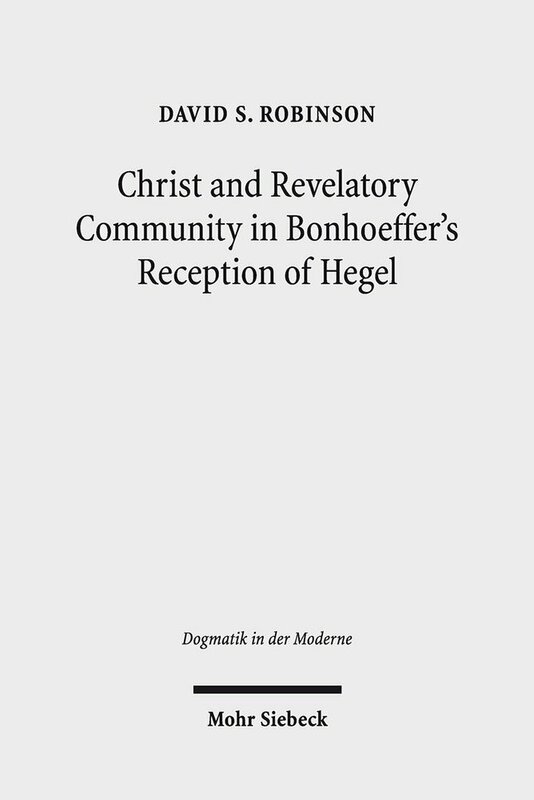 David S. Robinson, Christ and Revelatory Community in Bonhoeffer’s Reception of Hegel, (Mohr Siebeck, Tübingen: 2018); ISBN978-3-16-155963, €60.00. Stephen J. Plant, Trinity Hall, University of Cambridge. What is true of philosophy is also true of Bonhoeffer’s theological reception of his great Berlin University forbear. While he is not, Robinson is careful to say, Hegelian, it is the case that ‘Bonhoeffer carries out a more complex variation on Hegel’s thought than is often recognised’ (230). Fresh consideration of Bonhoeffer’s reception of Hegel’s thought sheds light on the theological reception of Hegel and more generally on how theology is to construe its relationship to philosophy. More specifically in Bonhoeffer’s case, patient attention to how he differentiates his thinking from Hegel’s helps make better sense of how he understands Christ to be revealed and present in the Church. The book is in three parts. Part One takes its cue from the best known of Bonhoeffer’s comments on Hegel, in which he singled Hegel out among Idealists for criticism, because in his thought ‘the movement of Geist is turned in upon itself’ (p. 57, citation from Act and Being DBWE 2, 41-2). Robinson argues convincingly that Bonhoeffer is distinguishing theology from Hegelian philosophy in, for example, placing the Word before Geist (which Robinson wisely leaves untranslated to avoid reducing its scope to Holy Spirit, to Spirit or to Mind). But he is also modifying Hegel to do work in his theology. Bonhoeffer sets the form of Christ where Hegel set Geist, certainly a substantive change – but the dialectical structure of Hegel’s thought is retained in the relation of act and being, of faith and the Christian community. Robinson’s comparison of Hegel’s treatment of Genesis 1-3 and Bonhoeffer’s in Creation and Fall makes it clearer still that the theologian is drawing on Hegel with (forgive the pun) creative results. Part Two adds flesh, quite literally, to Hegel’s reduction of Christ to ‘Idea’. As in Part One, this is done in two stages. Chapter 3 focusses on Christology and Chapter 4 on Christ as preaching and sacrament. This makes clear that Bonhoeffer’s Lutheran doctrine concerning the instantiation of Christ in the preached Word and the sacraments, an incarnational ‘ecology’ in which Word and Sacrament complement and fulfil each other, carries forward the Christology of his 1932/33 lectures. These Two parts of the book are immensely rewarding. It is rarer than it ought to be for theologians to read philosophers well, but Robinson manages here a close and sophisticated reading not only of Bonhoeffer, particularly his two dissertations and his 1933 Hegel seminar, but also of Hegel’s Lectures on the Philosophy of History and Phenomenology of Spirit, which were the Hegelian texts to which Bonhoeffer paid sustained attention. Part Three deals (once more in two chapters) with ‘The Body of Christ after “World History”’. To my mind, this part of the argument seemed less well anchored in the close textual comparison that successfully drove the first two parts of the book. Chapter 5 scores a good point in comparing Hegel’s nuanced understanding of the French Revolution with Bonhoeffer’s in the unfinished fragment on ‘Heritage and Decay’ in his Ethics. But Bonhoeffer is, I suspect, rather more conservative than Hegel in his political views than Robinson credits. The essentially Lutheran trajectory of Bonhoeffer’s ‘political’ theology, so ably recently set out by Michael P. DeJonge, is largely missing. More significantly Robinson inexplicably neglects the resemblance, possibly influenced by their shared Lutheran inheritance, between Hegel’s accounts of family, civil society and the state in his Philosophy of Right and Bonhoeffer’s attempts to rework the orders of creation in his theology of the divine mandates. The treatment of Volk, race and history in the final Chapter 6 similarly yielded less insight, for me, than earlier chapters. Winston Churchill is reputed to have said that ‘he who never changes his mind never changes anything’: well, in the first two parts of his book Robinson changed my mind about Bonhoeffer’s reception of Hegel. He is right: a more nuanced accounts of Hegel’s thought vis-à-vis Bonhoeffers own makes ‘strictly oppositional construal of the two figures’ (195) unsustainable. Robinson gives the best reading of that relationship to date, and in doing so makes an important contribution to our grasp of Bonhoeffer’s theology, particularly his early theology and his Christology. Christ and Revelatory Community in Bonhoeffer’s Reception of Hegel is decidedly a book for advanced interpreters of Bonhoeffer, by whom it deserves to be widely read. David S. Robinson holds a PhD in Systematic Theology and Ethics from The University of Edinburgh and is currently a Post-Doctoral Fellow in Theology and Science at Regent College and Research Associate at Vancouver School of Theology, Vancouver, British Columbia, Canada.